The MP Eric Joyce has been fined £3000 but avoided jail after pleading guilty to a drunken assault on four politicians in a parliamentary bar on the 22nd February. He was given a 12 month community order - banning him from entering pubs and licensed premises for three months - and imposed with a curfew order from Friday to Sunday. The 51-year-old former soldier reportedly went berserk without provocation after declaring:"There are too many f****** Tories in here". Mr Joyce headbutted Conservative MP Stuart Andrew during the bar brawl. He also attacked Tory councillors Luke Mackenzie and Ben Maney before turning on Labour whip Phillip Wilson. He was ordered to pay £1,400 to the victims of his assault. Earlier, speaking outside court, Mr Joyce apologised for his behaviour and said he was lucky to avoid prison, but said he did not intend to stand down as an MP before the next election. Eric Joyce faces expulsion from Labour after the party launched an internal disciplinary investigation. 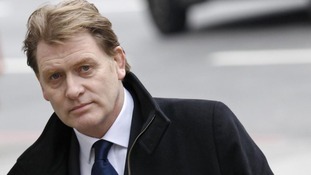 A Scottish Labour Party spokesman said: "Eric Joyce was immediately suspended from the party. "He remains suspended following the completion of the legal process and the Labour Party's disciplinary process will now take place." Labour MP Eric Joyce pleaded guilty to four charges of assault following his arrest in a bar fight inside the Palace of Westminster.